Beyond Apple's parade of slick, game-changing products, the company boasts a highly successful retail strategy. 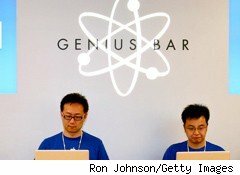 One key part of that strategy's foundation has been the combination of the Genius Bar and Apple Care, a unique program that allows Apple (AAPL) customers to meet one-on-one with support techs in the nearest Apple Store, virtually on-demand. Countless numbers of customers have decided they're more comfortable going with Apple products precisely because they know they'd always be able to talk to a live person -- in person -- quickly, if they needed help. And that's why the launch of Apple's new Joint Venture is interesting. Joint Venture is a new marketing push by Apple to provide lightweight technology consulting services to small businesses. Pricing details are somewhat murky, but the offering appears to run $499 to handle info-tech support and configuration for five Apple users and their devices. Naturally, this includes Genius Bar support. The move could take more business away from the Apple Consultant Network, a cadre of mom-and-pop shops that have traditionally filled the gap for Apple with small-business clients. Apple has traditionally lagged in the enterprise marketplace. Yes, coders at Facebook and Google (GOOG) are given a choice of Apple or Windows when they get their work computers, but most of Corporate America, and the world, still runs on Windows. The iPhone and its halo effect have opened the door a crack because many corporate IT departments have agreed to allow iPhone users access corporate networks from their handsets. The iPad is likely to increase demand further for business users. But Apple is targeting Joint Venture at small companies, the sort that may not be tech-savvy and may have one person on staff, or a part-time consultant, who handles their chief information officer duties. This is actually a multibillion dollar market (exact figures are hard to come by, but it encompasses roughly 6 million small businesses that employ people beyond their owners, according to the U.S. 2005 Census) and a highly coveted one for IT hardware and software providers. That's because these businesses pay a higher premium for IT gear compared to big corporations, which can negotiate sweetheart deals through their volume purchases. Those businesses are more likely, in turn, to use Web-based email, a configuration that makes it much easier to run Macs, because all you need is a fast Internet connection. True, it's entirely possible to have an Exchange server hosted by someone else or even by Microsoft, and that option has been quite popular. Another key factor is the preponderance of small businesses using Apple hardware that are creative in nature. Design shops, advertising firms and other similar operations are more likely to spend more for higher-performance -- and more profitable -- software and hardware than other businesses. By consulting directly with these businesses, Apple can get a foot in the door and not only sell its services, but also more products. Not to say that Apple hasn't tried to do things like this before. It has long had dedicated teams trying to enterprises. But this effort seems to signal a new, more concentrated push for the lucrative small-biz segment and extend Apple's reach into the offices of America, and perhaps eventually the rest of the world.